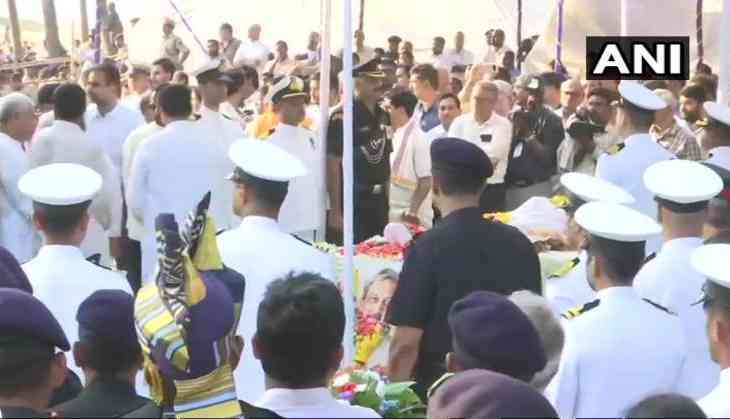 Goa Chief Minister and former Defence Minister cremated with full state honours at Panjim's Miramar Beach. Prime Minister Narendra Modi, Union Minister Nitin Gadkari, Defence Minister Nirmala Sitharaman, a battery of ministers from the Centre and states government paid their last respects to late Goa CM. "Paid tributes to my friend Shri Manohar Parrikar. He personified humility, simplicity and compassion. The good work he has done will be remembered for years to come," PM Modi tweeted. Parrikar, who was suffering from a pancreatic ailment since February last year, hadn’t recovered and passed away on Sunday evening. Since the issue was diagnosed, Parrikar went to the US and thereafter, to the All India Institute of Medical Sciences (AIIMS) in Delhi. Government of India had announced a national mourning on March 18 after the demise of Parrikar, and have said that full statehood honour would be accorded to the Goa Chief Minister.